Flashback Weekend is proud to welcome “CANNIBAL HOLOCAUST” star Robert Kerman and Grindhouse Releasing co-founder Bob Murawski as guests at Flashback Weekend Chicago Horror Convention to be held Aug. 8-10, 2014 at the Crowne Plaza Chicago O’Hare in Rosemont, IL. Robert Kerman and Bob Murawski will be signing autographs at the Grindhouse Releasing table and will present a Q & A on the Italian Horror Classic “CANNIBAL HOLOCAUST”. The Q & A will be moderated by Steve “Capone” Prokopy of “Ain’t it Cool News” on Saturday August 9, 2014. “CANNIBAL HOLOCAUST” presents the ‘found footage’ of four documentary filmmakers who experience brutal death at the hands of a savage South American tribe of flesh-eaters. The footage is so intense so graphic and so unflinching in its realism that the director and producer of “CANNIBAL HOLOCAUST” were arrested upon its original release and the film was seized. Grindhouse Releasing’s “CANNIBAL HOLOCAUST” Deluxe Edition Blu-ray is the ultimate home video presentation of this notorious classic named by Entertainment Weekly as “one of the most controversial films ever made”. A #1 bestseller on Amazon.com and Diabolik DVD’s top-selling title of all time, the 3-disc Blu-ray/DVD/CD set includes a wealth of new special features and a brilliant remaster of the original score by Academy Award-nominated composer Riz Ortolani (“More”, theme from “MONDO CANE”). Fans and critics are already hailing “CANNIBAL HOLOCAUST” as the Blu-ray release of the year. CANNIBAL HOLOCAUST 35mm Drive-In and Theatrical re-release! To celebrate the release of the “CANNIBAL HOLOCAUST” Blu-ray, Grindhouse Releasing is screening the film at the historic Midway Drive-In located in Dixon, Illinois. Flashback Weekend’s Dusk to Dawn Horror Fest set for Saturday September 20 will include a 35mm showing of the film. The movie will also be shown with Exhumed Films at International House (http://ihousephilly.org. ), and Aug. 22 & 23 in San Francisco at Landmark’s Clay Theatre with star Carl Gabriel Yorke to attend both shows! Visit www.GrindhouseReleasing.com for additional screening dates. Robert Kerman and Bob Murawski will join the all-star Flashback Weekend 2014 celebrity guest line-up including horror legends Robert Englund (“Freddy Krueger”), a “PHANTASM” 35th anniversary reunion featuring director Don Coscarelli, Angus Scrimm (THE TALL MAN), and a full “PHANTASM” cast reunion, Lance Henriksen (ALIENS, NEAR DARK),Jen and Sylvia Soska, Katharine Isabelle, Traci Lords, Zach Galligan, Amanda Wyss, Ronee Blakley, Chicago Horror Host legend Svengoolie, and many more! Flashback Weekend also features a huge horror vendor room, evening entertainment including “PHANTASM” stars In Concert, Charles Band’s Full Moon Horror Roadshow, Costume Contest hosted by Svengoolie, Sinister Visions Zombie Pin-Up pageant, and more! 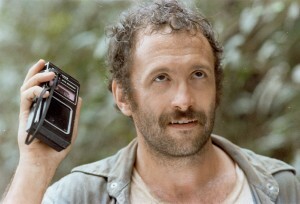 Robert Kerman is the star of the Ruggero Deodato classic “CANNIBAL HOLOCAUST” (1980). Robert also starred in the Italian horror classics “EATEN ALIVE” (1980), and “CANNIBAL FEROX” . A special edition “CANNIBAL HOLOCAUST” Blu-ray has just been released by Grindhouse Releasing which will be available at Mr. Kerman’s table. Bob Murawski is president of Grindhouse Releasing. He is also an Academy Award-winning film editor, known for his longtime collaboration with Sam Raimi on “ARMY OF DARKNESS”, “THE GIFT”, “SPIDER-MAN 1, 2 & 3”, “DRAG ME TO HELL” and “OZ THE GREAT AND POWERFUL”. In addition to his work with Raimi, Murawski won acclaim for his editing on Kathryn Bigelow’s 2009 Best Picture Academy Award winner “THE HURT LOCKER”, for which he took home the coveted Oscar (shared with co-editor and wife, Chris Innis). Other credits include John Woo’s “HARD TARGET” and music videos for MOTORHEAD and THE RAMONES. Grindhouse Releasing is a Hollywood-based distribution company dedicated to the restoration and preservation of classic exploitation films. Founded in 1996 by Murawski and the late Sage Stallone, Grindhouse has produced spectacular deluxe editions of Lucio Fulci’s “THE BEYOND”, Ruggero Deodato’s “CANNIBAL HOLOCAUST”, Umberto Lenzi’s “CANNIBAL FEROX”, David Durston’s 1970 drive-in classic “I DRINK YOUR BLOOD”, and Juan Piquer Simón’s outrageous chainsaw epic “PIECES”. Grindhouse Releasing is also committed to theatrical distribution. The company recently presented the theatrical releases of the long lost psychedelic odyssey “AN AMERICAN HIPPIE IN ISRAEL”, Duke Mitchell’s previously unfinished 1976 crime sage “GONE WITH THE POPE”, Bill Lustig’s notorious film “MANIAC”, and the theatrical re-release and negative restoration of Sam Raimi’s “EVIL DEAD”, all presented in glorious 35mm in theaters throughout the U.S. and Canada. Founded in 2002 by Mike and Mia Kerz, Flashback Weekend is Chicago’s largest and longest running Horror convention. Its philanthropic efforts are dedicated to the preservation of the American Drive-In. Flashback Weekend owns and operates the Midway Drive-In located in Dixon, IL to support the film industry and to present classic 35mm horror film festivals. For this reason, all net proceeds from Flashback Weekend go to the preservation and operation of the Midway Drive-In and 35mm film preservation. FLASHBACK WEEKEND TICKETS NOW ON SALE! Visit www.flashbackweekend.com for advance ticket sales. For additional information, call (847) 647-3124.